I hate clutter. If I could get rid of half the stuff in my house, it would take two dumpsters and five days of work. As I clean my house—the kids and my wife at the Fine Arts Museum in Boston—I’m throwing away every useless item I see on the floor. All this clutter makes me think of the clutter some jobseekers have on their résumé. And I imagine the employers feel the way I’m feeling right now. I met with a customer the other day to critique his résumé. It was four pages long; but that’s not what made critiquing it difficult—it was wading through the clutter on it. Here are some examples of duty statements, plus one accomplishment. The first four duty statements were clutter; they added nothing to his résumé. The last statement, a quantified accomplishment, said something worth reading. It talked about his ability to lead, which effectively covered the first two bullet points. I asked him about the newsletter to which he contributed articles. He told me it was initially sent via e-mail to 60 partners and customers, and in six months time the readership had grown to 12,000. As well, he wrote two, sometimes three articles a month for it; in which he talked about product releases, offered tips on data storage, and announced tradeshows. He often received favorable reviews from customers, OEMs and VARs. He was fine with getting rid of the meetings’ duty statement but was reluctant to let go of hiring and firing employees. I asked him how many employees he had to fire, aside from the ones that were let go because of downsizing. He told me, a lot. “Well, doesn’t that mean you made poor hiring decisions,” I asked him? He didn’t respond. Reduced sales force by 40% due to budget restraints, while surpassing productivity expectations by 25%. Spearheaded the company’s first pay-for-service program which increased sales 30% and earned the sales department an Award of Excellence. Authored articles for the company’s monthly newsletter, announcing product releases, providing tips on color management, and promoting tradeshows; increasing readership from 60 to 12,000 in just six months. He was still a little bummed because he wanted to demonstrate that he had hired and terminated employees. Isn’t that what managers do, he asked me? Yeah, I wanted to say, but they don’t fire people because they made bad hiring decisions. 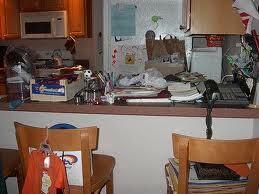 So unlike the clutter that occupies my house, the clutter on my customer’s résumé was drastically reduced. This entry was posted in Résumé Writing and tagged accomplishment statements, resume critiques, resumes on January 5, 2012 by Things Career Related. I wouldn’t say my home is that cluttered but cluttered, nonetheless. We need to make resumes easier to read, plain and simple. Why didn’t you mention that his newsletter went from 60 readers to 12,000 in just 6 months? I would put that in a summary at the top of the page! That is INCREDIBLE!!! Good example – Thanks! I agree that decluttering is difficult for resume owners who insist that every task (I like your term “duty”) is importrant. I use the “so what?” method too after each bullet to illustrate that a laundry list of tasks without the value or quantitative accomplishment is not very compelling. There is only so much real estate on a resume – it must be developed wisely to spotlight the most important skills and accomplishments relative to the position sought.